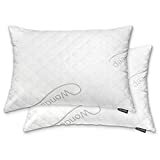 The Italian Luxury Premium Gold Goose Down Alternative Pillows are crafted in super plush gel fiber and expertly tailored to ensure maximum comfort in all sleeping positions! The smooth, dobby striped shell and zero-shift construction ensure a consistent level of comfort no matter what position you sleep in or how much you move in the night. You will feel like you are sleeping on a cloud. They are stylish, luxurious, and extremely comfortable! They are dust mite, mold, and mildew resistant. Plus, they are completely allergen and chemical free. 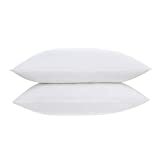 Our pillows are a great choice for people who suffer from asthma, allergies, and other respiratory issues.Don’t wait! Purchase your own Italian Luxury Premium Gold Goose Down Alternative Pillows NOW! This set of 2 Queen size pillows is expertly tailored using 240 Thread Count cotton fabric that offers double needled corded edges. 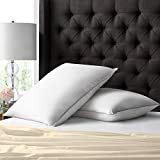 These professionally finished pillows with high thread count provide superior comfort against your skin along with added durability that easily resists wear and tears to ensure a finished look for your bedroom. 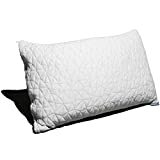 Snuggle away with your partner for a cozy and restful night’s sleep with our architecturally designed Fiber Fill Pillow that cushions your pressure points while you slowly drift off into a heavenly sleep. 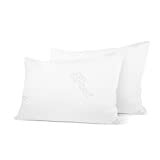 The Beckham Hotel Collection Down Feather Pillows are crafted in a special blend of down/feather and down alternative fibers. Within the unique chamber-style construction, there is an inner chamber made of luxurious, responsibly sourced down/feathers and an outer chamber of incredibly soft and cloud-like down alternative gel fibers. 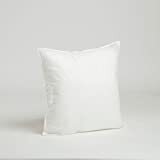 Our pillows are 100% hypoallergenic, and are resistant to dust mites, mold, mildew, and other allergens. The down/feathers in our product are has been certified to the RDS (Responsible Down Standard) by Control Union, which safeguards the welfare of the geese and ducks that provide down and feathers for the down products we all love. Don’t Wait! 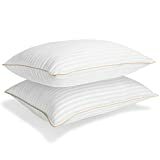 Purchase your own Beckham Hotel Collection Down Feather Pillows NOW! The Zen Bamboo Gel Fiber Filled Pillows are crafted with super plush gel fiber and expertly tailored to ensure maximum comfort in all sleeping positions! The jacquard Bamboo cover provides an extra level of support and elegance. You will feel like you are sleeping on a cloud. With their no-shift construction, our pillows are a great place to rest your head. They are stylish, luxurious, and extremely comfortable! They are dust mite, mold, and mildew resistant. Plus, they are completely allergen and chemical free. Our pillows are the perfect choice for people who suffer from asthma, allergies, and other respiratory issues.Don’t wait! Purchase your own Zen Bamboo Gel-Filled Fiber Pillows NOW!